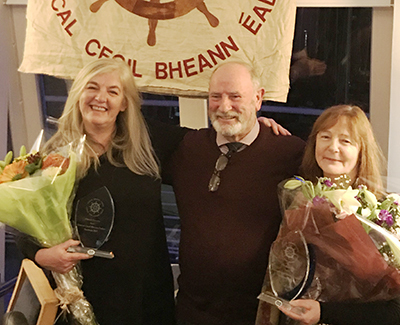 On 23rd November 2017, at Howth Yacht Club, Musicians’ Union of Ireland (MUI) Executive Committee member, Niamh Parsons, was appointed as a Saoi of the Howth Singing Circle (HSC). The award, made by Brian Doyle, was in recognition of Niamh’s service to the HSC over the previous eighteen years as singer, teacher and organiser. Doyle referred to Niamh’s eight CDs, her lengthy professional career as performer (especially now with guitarist, Graham Dunne), and to her teaching of many young performers – including the night’s Special Guest, Daoirí Farrell. Doyle also paid tribute to Niamh’s role within the MUI and called for support for the union’s defence of the beleaguered RTÉ orchestras. The HSC meets on the first Thursday of each month in the Abbey Tavern. In addition, the HSC has a Young Singer in Residence – fiddle player and singer, Cathal Caulfield; performs in community events like the Prawn Festival, Blessing of the Boats and Sutton Methodist Church Singathon for the Hospice; organises the celebrated Howth Burns Nicht each January; and has been the organising force behind the highly acclaimed Fiddle Bus that has brought Scots and Irish musicians together. Niamh has brought new songs and styles to the HSC, generously encouraged local singers, and provided a professional and informed perspective of club activities.